Perhaps better known as the founding members of the Portland, OR, instrumental rock band Grails, who seem to release a new album every year which pushes the expectations for their already wide and varied sound, Alex Hall and Emil Amos are similarly prolific lately with their side project, Lilacs & Champagne. In 2008 alone, Grails released two strikingly different records: the fiery and chaotic Doomsdayer’s Holiday and the heavy stoner rock of Take Refuge in Clean Living. Their 2011 album, Deep Politics, almost defies definition, though songs like “Corridors of Power” lean in the direction of a Lilacs & Champagne track. Likewise, Hall and Amos’ alter ego in Lilacs boasts a similarly broad diversity. Grainy hip-hop beats are one sediment layer in their undulating composite, a consistent base layer that holds the music together. Beyond that, what goes on top is an eclectic array of forgotten genre LPs, soundtrack oddities, and random pulls from other forgotten corners of the record bin. Trying to play spot-the-sample might be a hopeless game, but wading into the unknown is one of the things that make Lilac & Champagne’s latest, Midnight Features, Vol. 2: Made Flesh, both inviting and challenging. In step with the rate of their output, Lilac and Champagne’s search for source material never stops. Reports of the death of the record store have been greatly exaggerated. Still standing are the Amoeba giants, the tenacious local indies, and the many random shops and market stalls scattered far and wide, full of accumulated stashes of old vinyl and out-of-print CDs coated in the dust of previous owners’ attics and closets. These are the playgrounds of collectors like Hall and Amos. Whenever rare free hours present themselves on tour, the guys jump in a cab and embark on record-scouting adventures, sometimes taking random chances, other times more prepared, with addresses of their favorite shops at the ready. On a recent European tour, Hall had his sights set on a few particular shops in the UK, Paris, and a particularly great one in Leipzig. 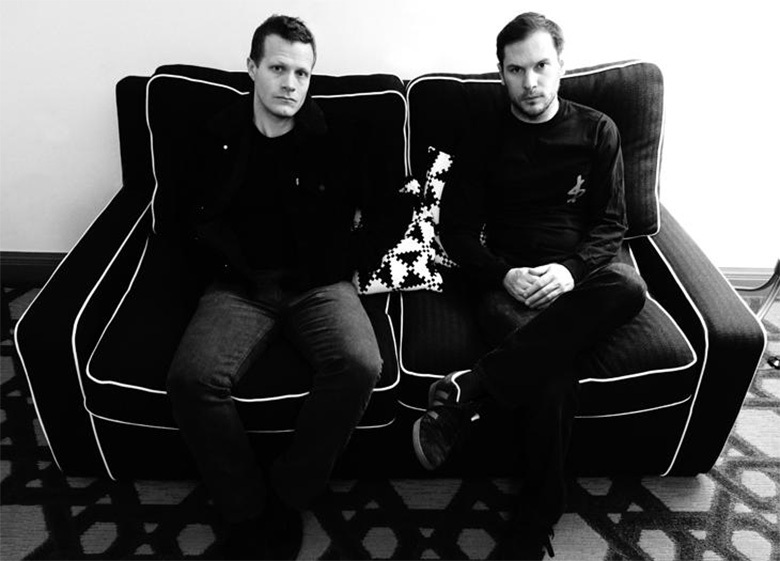 Hall and Amos have been music obsessives as far back as they can recall; they’ve been enthusiastic crate diggers as far back as the early 2000s, when they started playing together in Grails. They were joined by a few different musicians in the early stages of the group; after a more stable line-up came into shape, they released their debut album, The Burden of Hope, in 2003. Hall recounts that this coincided with a time on the musical landscape where the reissue machine was really starting to turn. Shining a light on potentially forgotten records from the ’60s and ’70s had been a part of the business for a long time, be it through legitimate re-releases, or, as was often the case, bootlegging. The ascendance of the Internet, however, enabled a blooming of reissue labels. The exponential increase in access to obscurities and rarified artifacts became something of a never-ending field day for the two of them. All of their record-collecting allows for a broad foundational base that the duo uses in DJing as well as incorporates their various musical projects. “Sampling is just a game of re-contextualization and juxtaposition. It’s kind of re-contextualization for its own sake. Putting two together to make a new statement, and in a context that feels new and modern. In a lot of these songs, there are probably samples from twenty or thirty different songs. It has this mosaic quality that creates an atmosphere that’s somehow reflective of all these different kinds of music. It kinds of stands on its own,” Hall comments. Dizzying as the range of their references may be, Lilacs & Champagne are drawn to certain atmospheres — specifically headier, moodier vibes, usually in a minor key. As evinced in its title, Midnight Features Vol. 2: Made Flesh, there’s also an overtly sensual tinge to their new album – yet the vibe, while apparent, was not necessary something they purposefully set out to achieve. “All we can do is sit down to work and do what feels intuitive and organic at the time,” Hall states, concluding that once one starts to accumulate so many sounds and materials, what emerges almost contextualizes itself naturally. After Lilacs & Champagne’s 2012 self-titled debut and the band’s 2013 follow-up, Danish & Blue, the Midnight Features Vol. 1: Shower Scene EP heralded a series that had already been preconceived as a series of “fantasy records” wherein the duo would insert themselves into different musical eras from recent history. According to the Mexican Summer website, “Shower Scene was inspired by the background music from 1970s TV shows, and this kind of prefab framework is one Hall is fond of. Grails took up a similar conceit for a trio of Black Tar Prophecies volumes in 2006, and have since added three more volumes. Lilacs & Champagne may not know exactly what the next edition of Midnight Features is going to be, but they are already talking about future ones. Conceiving a creative division between the first Lilacs & Champagne releases and the path they are currently on was a fairly quick decision. The early records had come together with just Amos and Hall in a home studio. Yet when it came time to rope in other people to bring their songs to a live setting, the new personnel stuck around, and they ended up re-writing much of the material from those first two albums. After re-recording “these sort of crazy, prog-y, psych-y, funky interpretations of the early Lilacs songs”, the duo didn’t know exactly how to put it all out. 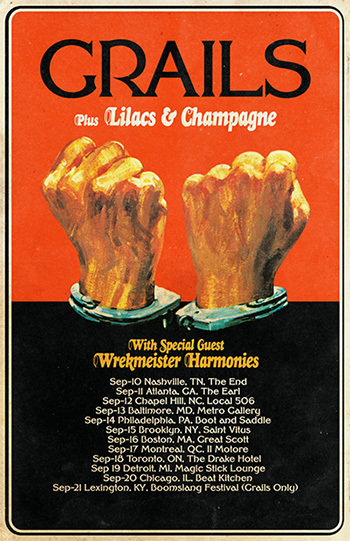 Lilacs & Champagne had become something of a “half-live-band, half lower, sample-based stuff” hybrid. 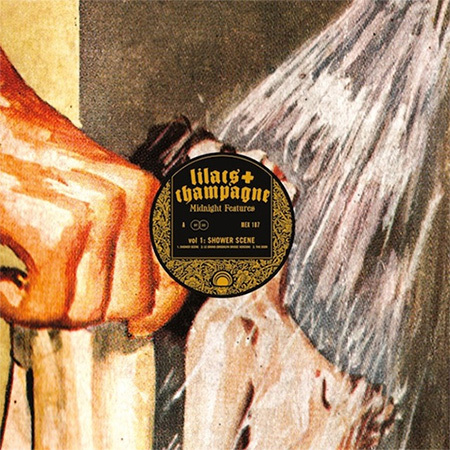 Along with the multitude of musical sources they cull from, other backwards-glancing influences have had an effect on how Lilacs & Champagne approach their music as well. One such influence has been the Marvel’s What If comic series. 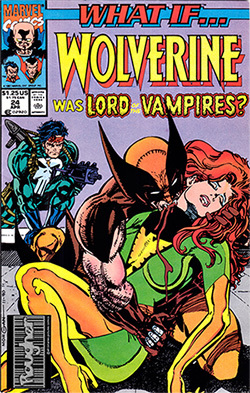 Initially running between 1977 and 1984, the series picked up again in the late ’80s through the ’90s, and then again in the mid ’00s. Its basic premise was to explore what might have resulted in the world of Marvel comics if certain events had played out differently. Considering how the notion of alternate realities applies to their music, Amos notes that Grails have always thrived on changing settings from album to album. With Lilacs & Champagne, the idea is to take that approach to “an even more hyper-colorized zone, where albums can take even sharper break-neck curves.” The group might not be major comic buffs in general, but the impact that they once made on their nascent sense of creativity is something that has stuck with Amos. That kind of open-mindedness is central to how Lilacs & Champagne approach their music. They are constantly engaged with their sense of curiosity. Their tastes may be refined, but they are also omnivorous. Midnight Features Vol. 2: Made Flesh alights the synapses and dusts off the forgotten corners of the brain where possibilities are without limit.